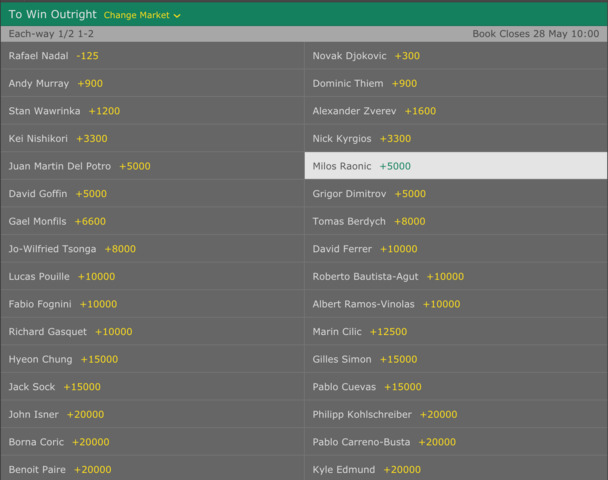 Milos Raonic is in action at this year's French Open and he is once again well placed to go deep into the tournament. The 26 year old is striving to be the first Canadian to win a grand slam singles title and in doing so reach parity with the biggest names in world tennis. Milos has been consistently close to the top for a number of years, but it remains to be seen whether he will mirror Andy Murray and reach elite status after toiling just below, or whether he will slowly be overtaken by generation next. Raonic plays his first match at Roland-Garros on Monday, May 29th and will be looking to coast through his first encounter with as little fuss as possible. It is so important in grand slam tournaments to manage workload, as consistent five-set matches with short turnarounds are not ideal if you want to be champion. As always, he will be using his big serve to win as many 'easy points' as possible, although it isn't always as effective on a clay surface. While it's a good idea to point out that Raonic's career win/loss record on clay is only marginally lower than his overall record, his record in terms of tournaments is not desirable coming into a French Open championship. All of his career victories have come on hard court surfaces, so it would be astonishing to see Raonic reach the final four here. With names like Nadal, Warwinka and Djokovic in the draw it is going to be a very uphill battle, although he can take heart from Andy Murray's breakthrough victory in last year's tournament. Raonic started this year ranked third in the ATP standings, a career-best for Milos and a sign that perhaps he was finally making ground on the world's best. His ranking has slipped back to sixth thanks mainly to a resurgence in form from Roger Federer and the re-emergence of Rafael Nadal after his injury issues. Still, sixth is impressive enough and his brief spell in the top three should have him hungry to make the necessary tweaks to his game and rise back to those levels. He enters Roland-Garros as the fifth seed. Milos Raonic plays his first game at 10:00am CET against Steve Darcis, the 38th placed Belgian. Darcis and Raonic have never met in an ATP tour fixture, so there is little for Raonic to look to when searching for ways to victory here, although his younger legs (Darcis is 33) and overall superiority should help him pass the first test of the tournament. If Raonic manages to make it through to the second week as expected, he will not have to face a seeded opponent until at least the fourth round now that twenty-sixth seed Gilles Muller is out of contention. His biggest test may come in the quarter finals with a possible meeting with nine time champion Rafael Nadal. We will have to wait and see how it all unfolds. Whatever happens, we will keep you updated with all the information you need including game times, upcoming opponents and we will mention the form as the tournament progresses.